England has Shakespeare, Big Ben, and the Royals. Scotland’s got Nessie, bagpipes, and single-malt whiskey. What about Wales, you ask? 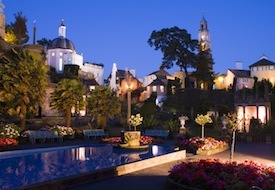 Well, as I found out during a recent visit, Wales has got hundreds of delightfully quirky undiscovered pleasures (such as Portmeirion, shown at left). Tucked into the southwest corner of Great Britain, this verdant green country of 3 million has 11 million sheep, 393,000 people named Jones, an 870-mile coastal walking path, 641 castles, and a seriously hard-to-pronounce language. But perhaps the most unexpected thing about Wales is the quality and character of its hotels. 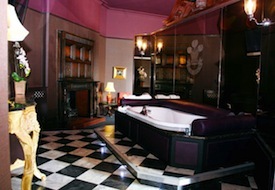 They range from castles and country houses to boutique properties with surprisingly contemporary decor. I know you’ll love Wales once you discover all that it has to offer – including an emerging local/sustainable food scene and some pretty inventive young chefs. Here are 10 favorite places to stay, all of which I visited last month. Some offer great value, others are splurges, but each is a unique spot from which to experience this welcoming and culture-rich country. The Penralit: This charming Edwardian mansion hotel called The Penralit, set on 42 acres near Aberporth Bay in West Wales, is an atmospheric and affordable base from which to explore everything from castles and historic steam railways to windswept beaches and flowering gardens. 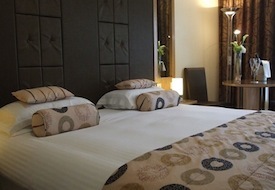 Its 26 rooms were refurbished in 2007 with a comfortable, contemporary style. The Penralit also has two restaurants, the more formal Bay and the indoor/outdoor Terrace, which is the perfect spot to enjoy a glass of wine and a delicious Penralit salad (mixed greens with flaked salmon, prawns, asparagus, and peas) on a sunny day. Rates start at $139/night. The Plough Inn at Rhosmaen: You’ll never guess what awaits you inside when you pull up to the unassuming stucco-faced Plough Inn at Rhosmaen, in Llandeilo near the Brecon Beacons, a wildly scenic range of sandstone mountains in South Central Wales. Even the modest lobby doesn't offer a hint of the modern decor – done in sophisticated neutrals or in rich garnet and pale green with brand new contemporary bathrooms – in the 14 rooms and suites. Another delight is the nuanced cuisine (crayfish and prawn ravioli, roast Greshingham duck breast) in the warm and inviting Plough restaurant on the main level. Rates start at $139/night. 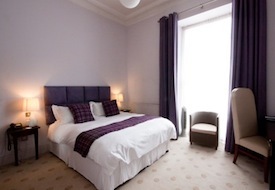 The Cawdor: Also in Llandeilo, but this time downtown, The Cawdor is a decidedly contemporary property inside as well, featuring 23 rooms and suites, most with spacious modern bathrooms. The majority are located up a staircase or two on the second and third floor, so be prepared to climb. On the ground level, a flagstone-floored bar and appealing lobby with a fireplace and leather sofas are adjacent to the Georgian-style dining room serving traditional-meets-modern dishes such as herb-rolled pork tenderloin and warm millefeuille of wild mushrooms. Rates start at $100/night (for the smallest rooms) and $130/night and up for the others. 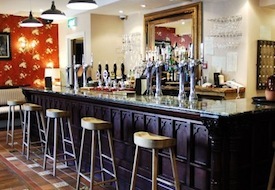 Guildhall Tavern Hotel & Restaurant: If you’re a fan of staying away from the popular tourist spots and getting to know a few locals, check out the Guildhall Tavern Hotel & Restaurant, a restored 16th-century coaching inn and restaurant in Denbigh. This Northeast Wales town has a castle with ancient stone walls (there’s a lovely walk around it) and a life-size statue of native son, Victorian-era explorer H. M. Stanley (of “Dr. Livingstone, I presume” fame). Guildhall features 11 charming rooms with modern comforts, but the standout feature is its convivial gastropub-like Denbigh Restaurant and Bar, where the food is both delicious and filling. Rates start at $169/night. The Castle Hotel: A former coaching inn in seaside Conwy, The Castle Hotel has a Victorian-era red brick and gray granite façade and is full of quirky nooks on the inside. There are 28 rooms in total, all located up massive wooden staircases and varying in size and decor based on price. The hotel’s two main assets are its location right in the center of town, allowing easy access to the castle, the walkable old town wall, and the scenic harbor, and its terrific Dawson’s Bar & Restaurant, where you can go casual with “nibbles” like deep-fried olives or fancy with entrees like pan-roasted breast of duckling. Rates start at $217/night. 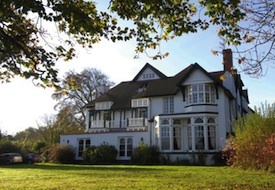 Plas Bodegroes: There’s something both sophisticated and salt-of-the-earth about Plas Bodegroes. Perhaps that’s because Chef Chris Chown and his wife Gunna have spent the past 25 years sharing their small slice of paradise, an award-winning restaurant and elegant 11-room inn, with guests. 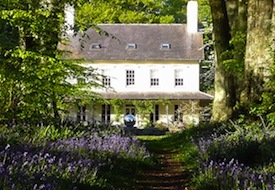 The Georgian manor house, located amid splendid gardens on the unspoiled Llyn Peninsula in Northwest Wales, has an old-fashioned verandah for afternoon reading or sunset cocktails with views of 200-year-old beech trees – but it also has a gallery-like walls featuring contemporary Welsh artists. Chown’s menus are also modern (smoked salmon and halibut terrazzo; local sea bass with crab, ginger, and pak choi) while the inn’s rooms are delicate, spacious, and airy. Rates start at $202/night. Portmeirion: The first thing that popped into my head when I laid eyes on Portmeirion was “Disneyland meets Hearst Castle.” Eccentric Welsh architect Clough Williams-Ellis wanted to recreate Portofino, Italy, when he began building this village-like resort set on an estuary near Porthmadog in West Wales in 1925 (it wasn’t completed until 1975). The result is a centuries-spanning mosaic of design styles – a soaring bell tower built with 12th-century castle stones, a Gothic pool pavilion, an 18th-century bathhouse colonnade, a Victorian castle – and a total of 53 rooms and suites, none alike. Dinners in the panoramic Dining Room are truly enjoyable – be sure to have a drink by the Italian Renaissance carved fireplace beforehand. Two other cool Portmeirion facts: The tide changes twice a day, turning the rushing estuary into a barren mud flat in a mere 12 minutes (and vice versa) and the 1960s British TV show The Prisoner was filmed here, making it popular with day-trippers (they leave by sunset). Rates start at $247/night, including breakfast and a three-course dinner. 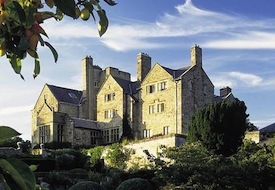 Bodysgallen Hall & Spa: If you like your hotels historic and set high on a hill, with creaking floors and flame-scarred stone fireplaces, Bodysgallen Hall & Spa, a country manor built from the 13th to the 17th centuries, delivers. Located just outside the picturesque coastal town of Conwy (home to 700-year-old Conwy Castle), Bodysgallen offers 15 rooms and suites in the main house, all with vintage floral decor, and 16 cottages, some adjacent to the spa and fitness center. The property’s highlight is its public spaces – from the formal gardens overlooking 200 acres of sheep-filled pastures and parkland to the oak-paneled Drawing Room. Rates start at $278/night. Ynyshir Hall: Sheep don't roam right outside Ynyshir Hall, a luxurious nine-room, 17th-century country house in Machynlleth – they wander all over the inside. Not literally, but rather artistically as this Relais & Chateaux member inn is owned by painter Robert Reen and his wife Joan, and Robert’s favorite subjects just happen to be white and wooly. The Reens have created a vibrant yet serene haven with colorful, antiques-filled rooms named for artists from Vermeer to Matisse. 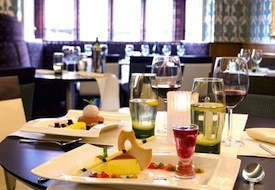 Chef Paul Croasdale creates nightly à la carte and tasting menus with items such as citrus-roasted hand-dived scallops and herb-crusted Welsh mountain lamb. Rates start at $427/night. Ruthin Castle Hotel: What’s more regal than a peacock parade outside your window in the morning? How about spending the night in Ruthin Castle, a circa-1826 stunner on grounds where a castle has stood for more than 700 years? If you can, splurge on authenticity and book one of the four lavish Royal Salons or the top-of-the-line Prince of Wales Suite (that’s the suite’s bathroom in the photo at left) located in the main castle; if you’re on a budget, you can sometimes come in under $200/night in a smaller and more contemporary Regal or Noble Rooms. 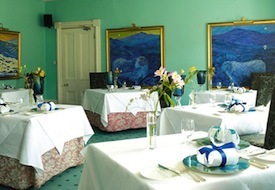 The grounds are magnificent while the cuisine in red-walled, chandelier-topped Bertie’s restaurant is as decadent as the decor. Ruthin itself is a medieval market town with a cool contemporary Craft Centre that’s worth a visit. Rates start at $189/night, with top rooms costing about $400/night. See our Wales destination guide for more trip-planning information, then use our Travel Search price comparison tool to find the lowest rate on flights, hotels, cruises, and more travel deals.